Direct to Business Wholesale Accounts and Pricing available! 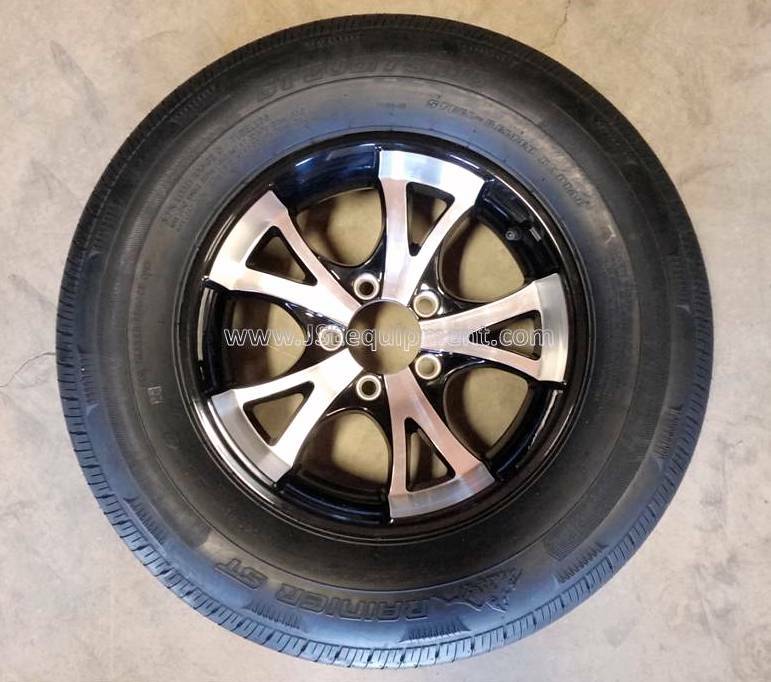 Other Rim styles and Tire sizes may be available. 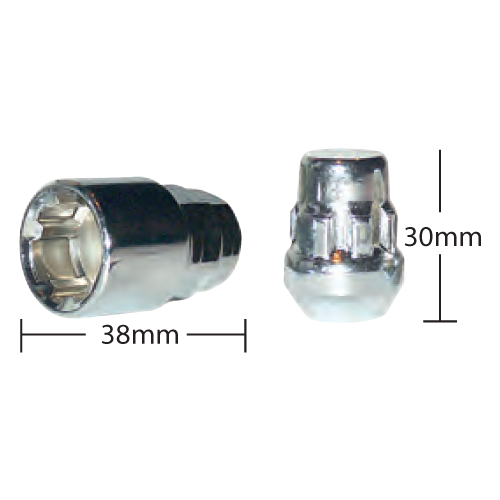 *IN STOCK* Fits most 12" wheel lugs, 1.25cm stud width, 21mm hex head. 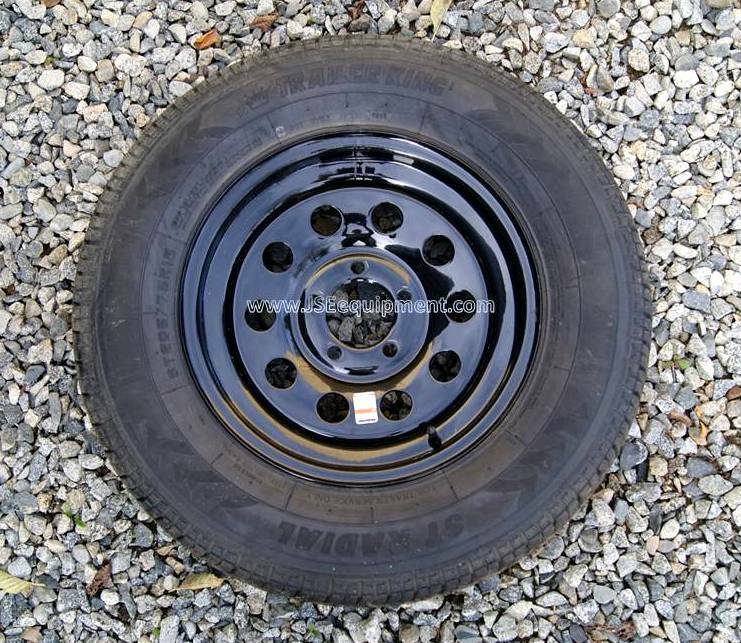 *IN STOCK* Fits most 13" - 15" wheel lugs, 1/2 stud width, 20mm hex head. 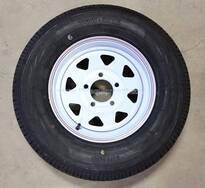 *NEW* Trailer lugs wheel locks, Set of 4 with key, fits 1/2" stud R/H Thread, works on most 13" to 16" wheels. 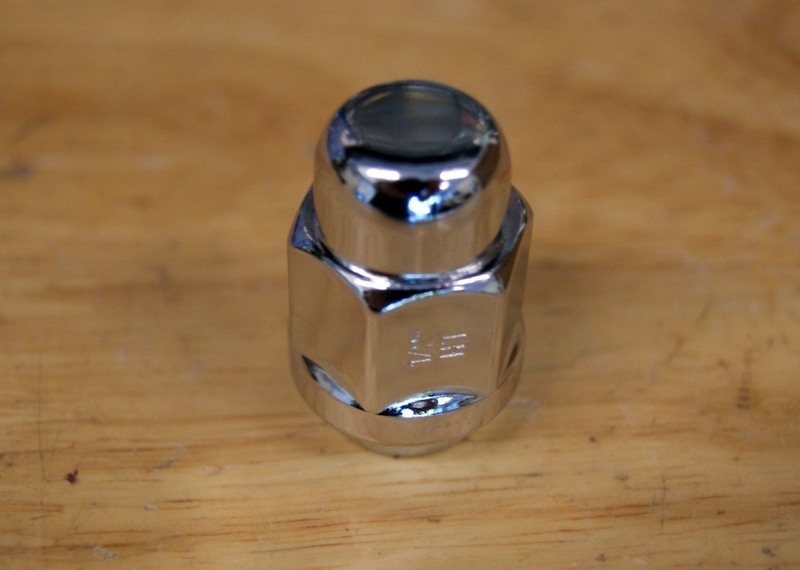 HUB COVER fits 5 ON 4-1/2", 3.18" OD, EZ Lube with end cap, Chrome $8 ea. 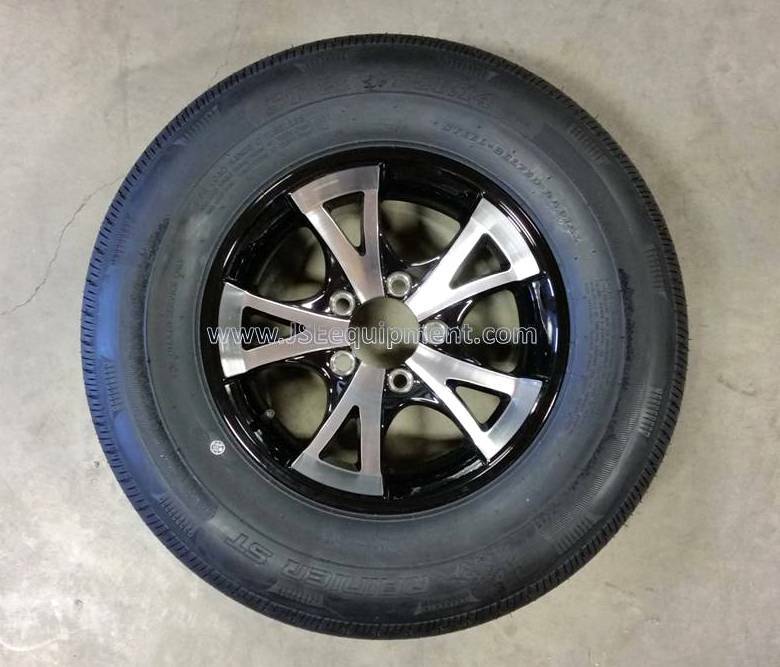 *IN STOCK* Special Buy! 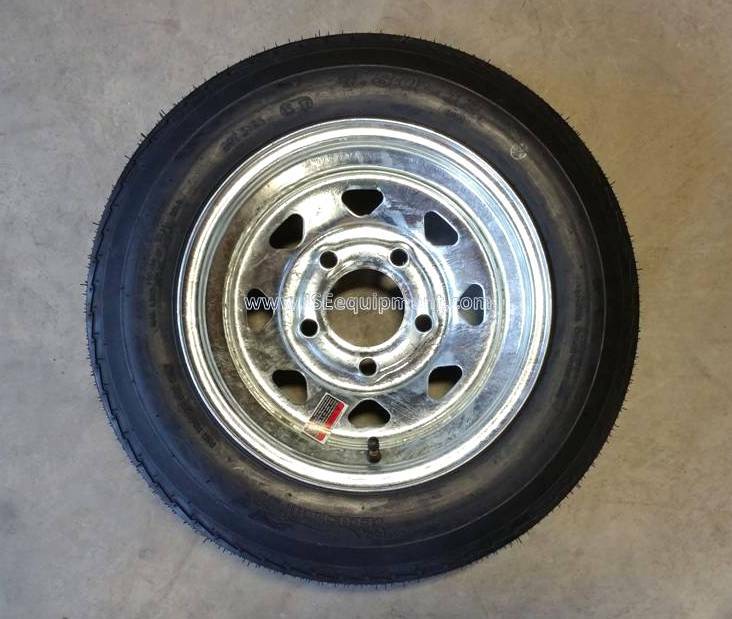 Fits most 13" - 15" wheels, Chrome Housing, Chrome Plastic cap. 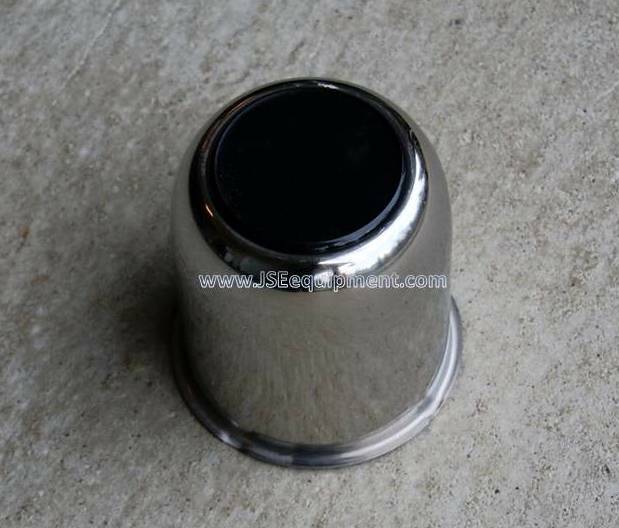 HUB COVER fits 5 ON 4-1/2", 3.18" OD, EZ Lube with end cap, Stainless / Black $10 ea. 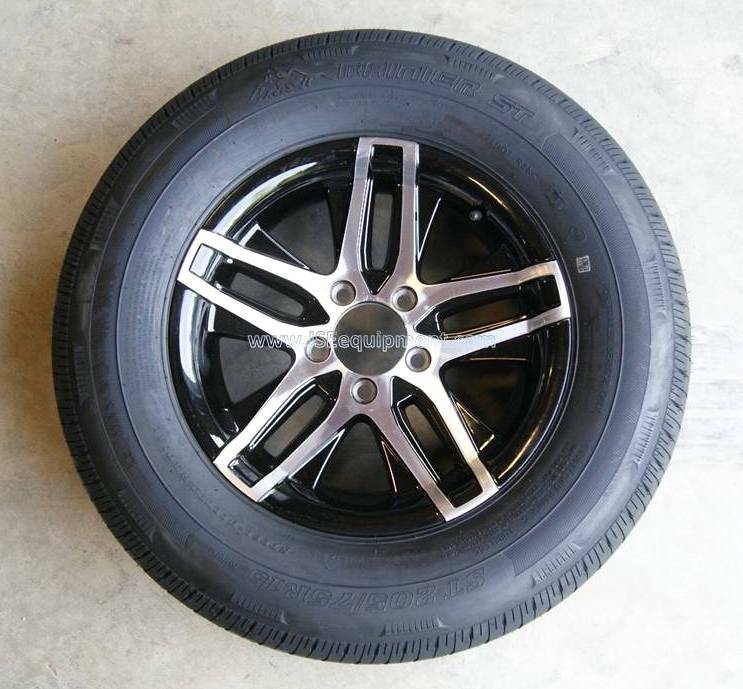 *IN STOCK* Fits most 13" - 15" wheels, Stainless Housing, Black Plastic cap. 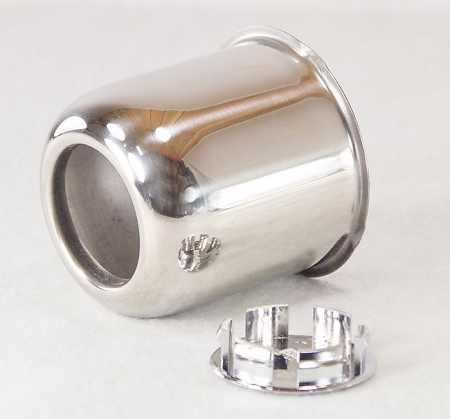 HUB COVER fits 5 ON 4-1/2", 3.18" OD, EZ Lube with end cap, Chrome $10 ea. 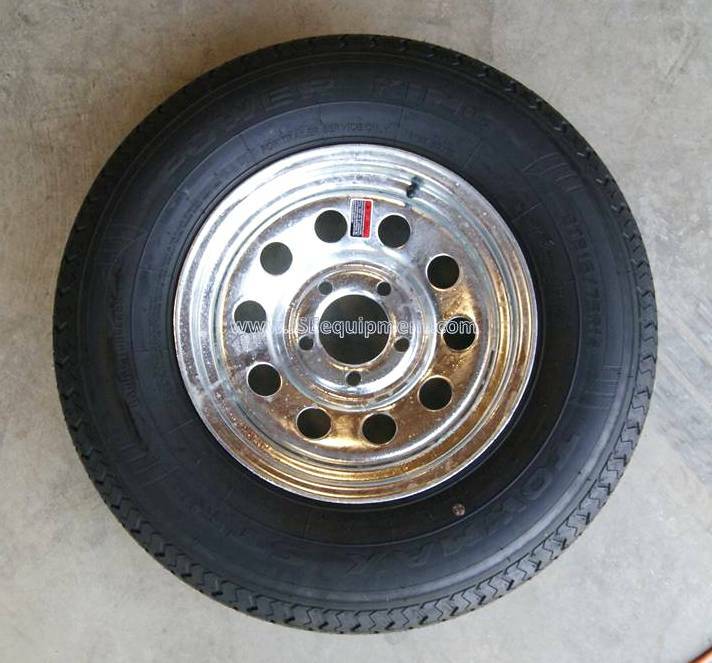 *IN STOCK* Fits most 13" - 15" wheels, Chrome Housing, Chrome Plastic cap. 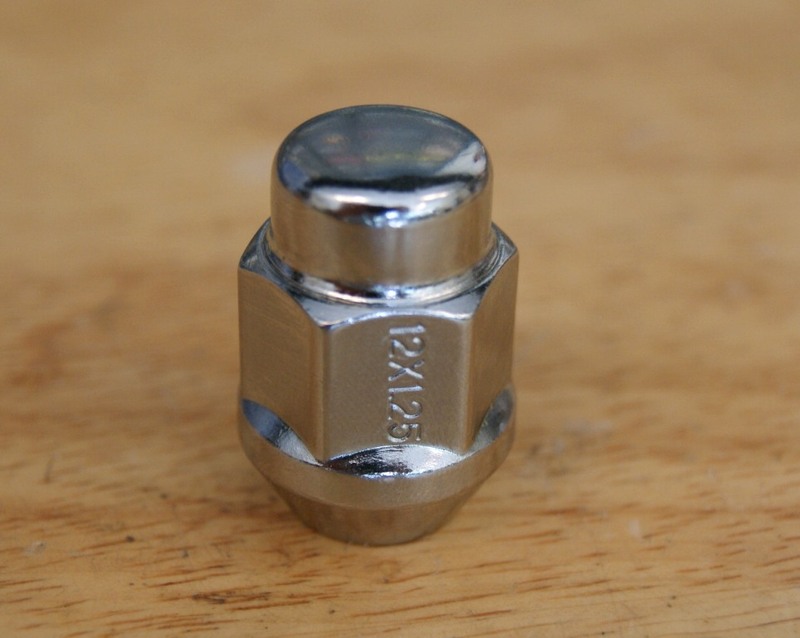 HUB COVER fits 5 ON 4-1/2", 3.18" OD, Open EZ Lube end, Metal, Chrome $15 ea. 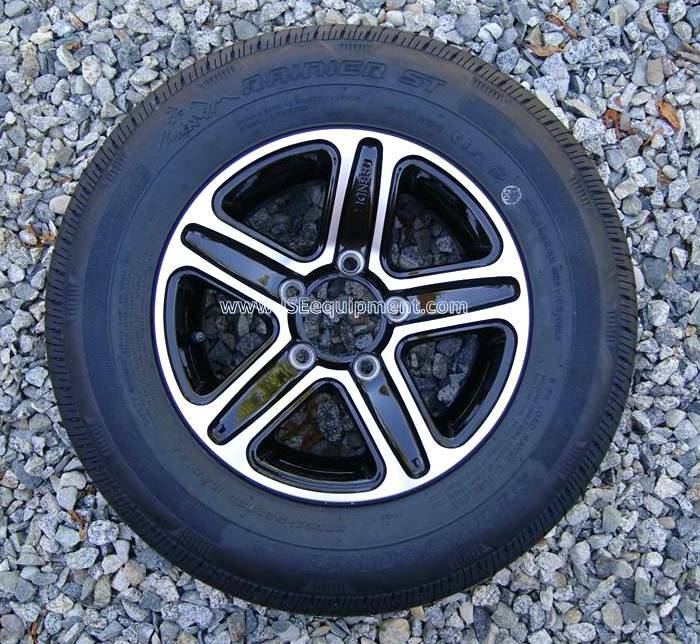 TSBC Tire Disposal levy applies to all "NEW" Tires. 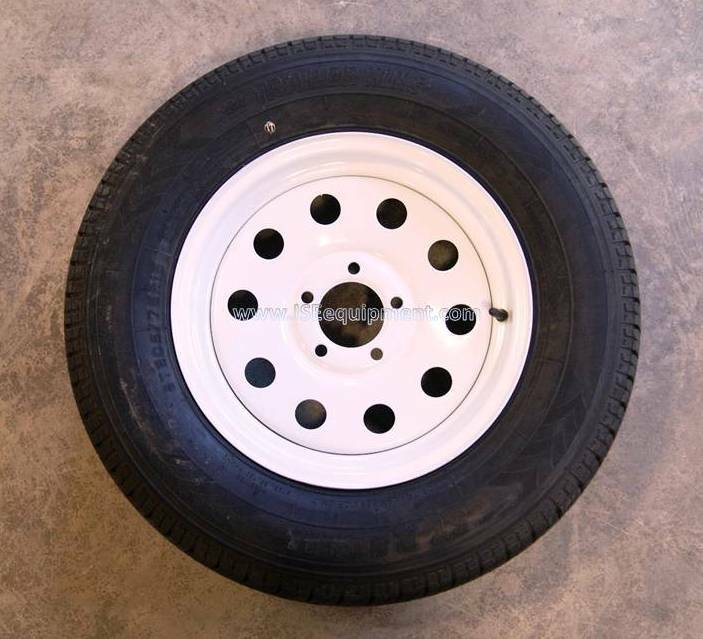 *IN STOCK* 12" Trailer wheel, 4.80 x 12", B Rated 780 lb Capacity, 4 Bolt with 4" Diameter mount holes, White Spoke rim. *CLEARANCE* ONLY 1 AVAILABLE! 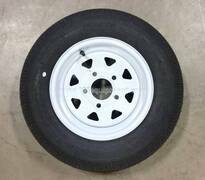 *1 Only IN STOCK* 12" Trailer wheel, 4.80 x 12", B Rated 780 lb Capacity, 4 Bolt with 4" Diameter mount holes, White Spoke rim. *CLEARANCE* ONLY 1 AVAILABLE! 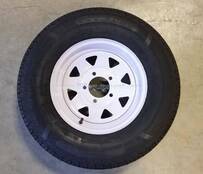 *IN STOCK* 12" Trailer Wheel 5.30 x 12, C Rated 1045 lb Capacity, Eco Trail Brand Tire, 5 Bolt with 4.5 Diameter mount holes, Aluminum Spoke Rim. *OUT of STOCK* ETA approx. 2 months. Only sold in pairs of 2! 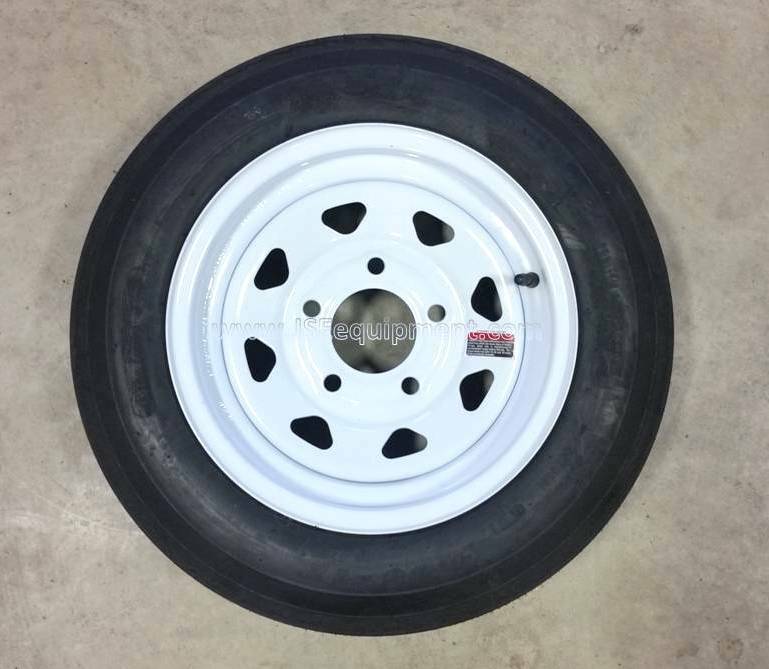 *IN STOCK* 13" Trailer Wheel ST185/80R13C Radial Tire, 1470 lb Capacity, 5 Bolt with 4.5 Diameter mount holes, Journey Brand Tire, Spoke Rim, White. 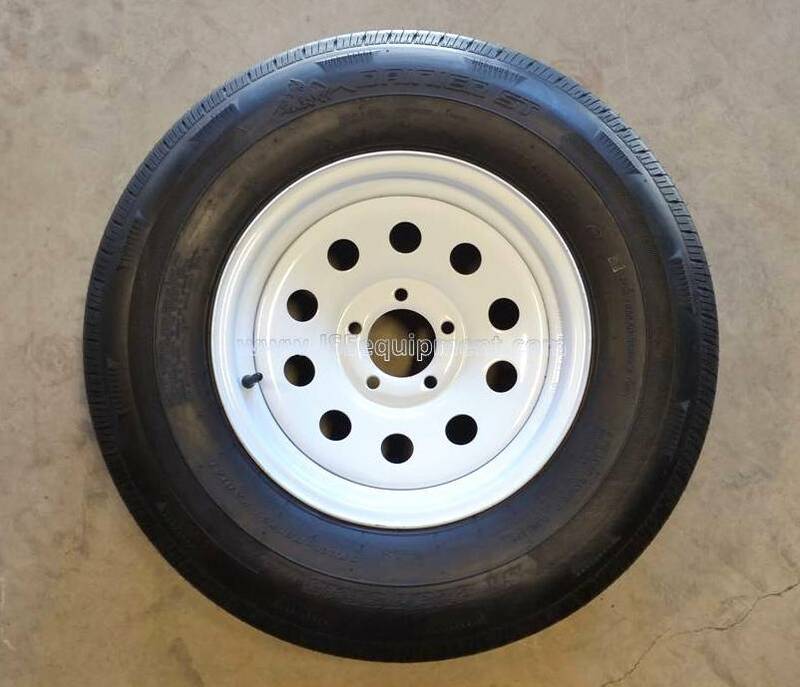 *IN STOCK* 13" Trailer Wheel ST185/80R13C Radial Tire, 1470 lb Capacity, 5 Bolt with 4.5 Diameter mount holes, RAINIER Brand Tire, Spoke Rim, White. 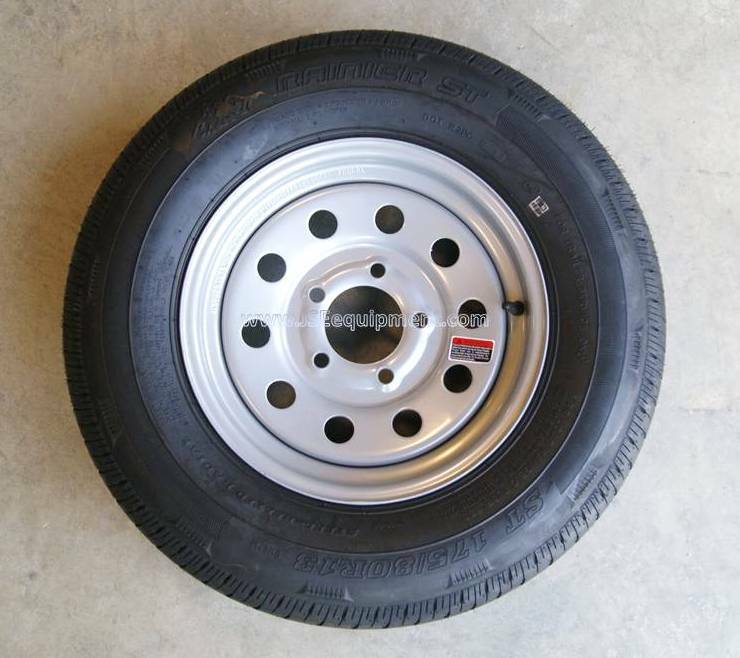 13" Trailer Wheel ST185/80R13C Radial Tire, 1470 lb Capacity, 5 Bolt with 4.5 Diameter mount holes, Journey Brand Tire, Aluminum/Black Spoke Rim with center cap. 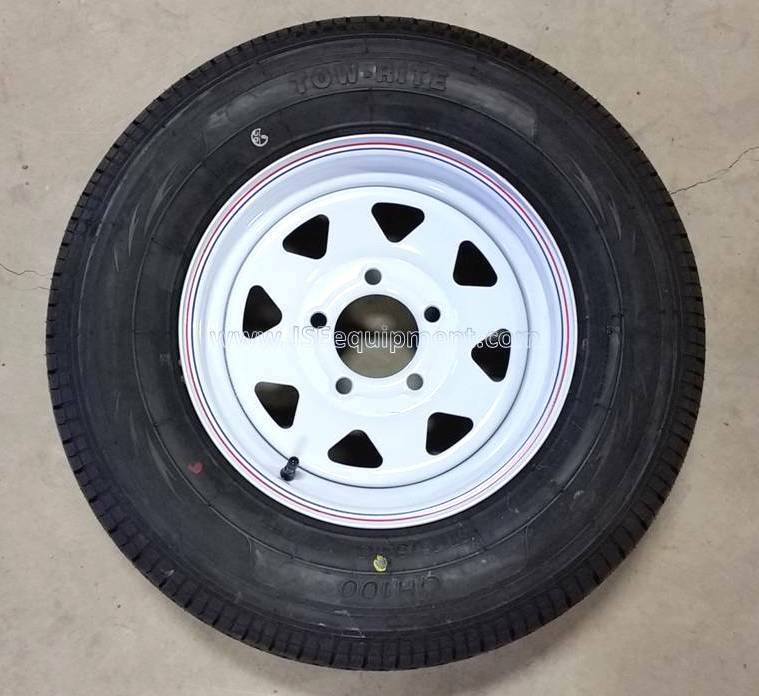 IN STOCK *Limited Quantity Only 3 left, Special Buy* 15" Trailer Wheel ST205/75R15C Radial Tire, 1820 lb Capacity, 5 Bolt with 4.5 Diameter mount holes, TOW RITE Brand, White Spoke Style Rim. IN STOCK*Limited Quantity, Special Buy* Only 4 available. 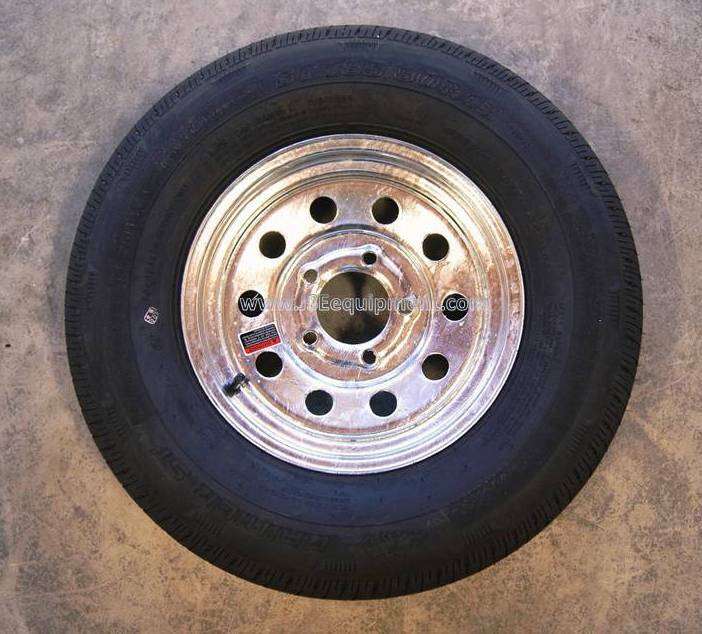 15" Trailer Wheel ST205/75R15C Radial Tire, 1820 lb Capacity, 5 Bolt with 4.5 Diameter mount holes, TOW RITE Brand, Galvanized Spoke Style Rim. 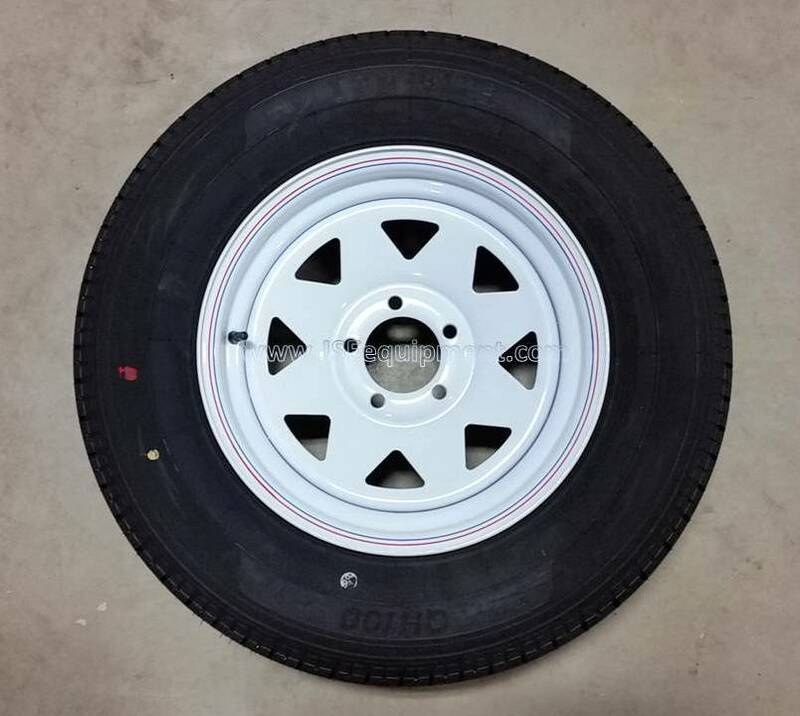 *IN STOCK* 15" Trailer Wheel ST205/75R15C Radial Tire, 1820 lb Capacity, 5 Bolt with 4.5 Diameter mount holes, Trailer King or Trailer King Brand, White MOD Style Rim. 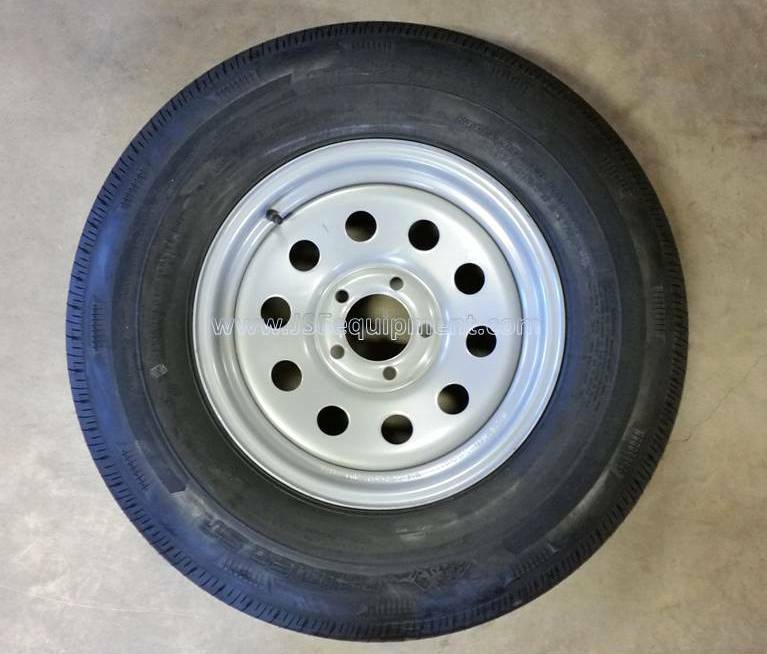 *IN STOCK* 15" Trailer Wheel ST205/75R15C Radial Tire, 1820 lb Capacity, 5 Bolt with 4.5 Diameter mount holes, Rainier or Trailer King Brand, Silver MOD Style Rim. 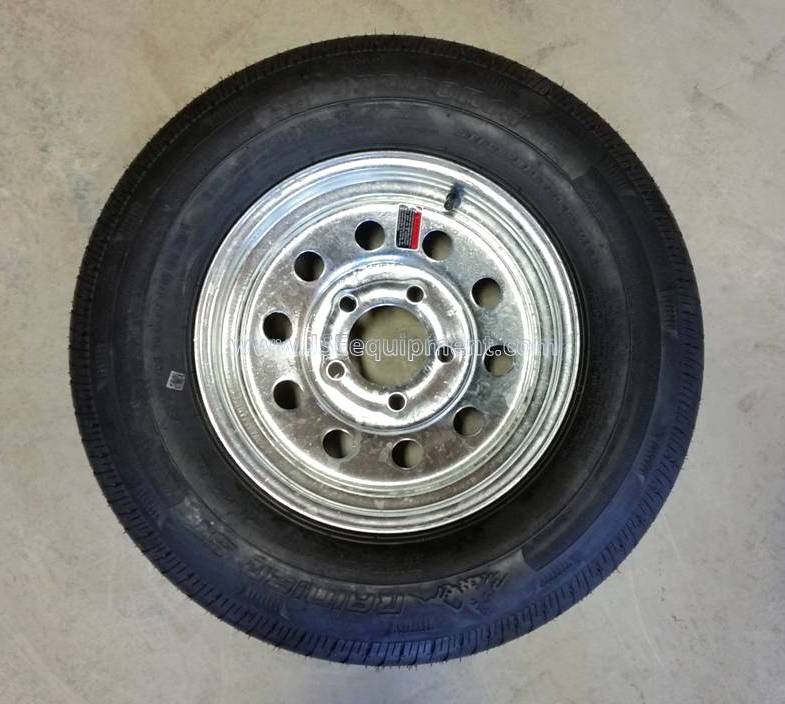 15" Trailer Wheel ST205/75R15C Radial Tire, 1820 lb Capacity, 5 Bolt with 4.5 Diameter mount holes, Trailer King Brand, Black MOD Style Rim. 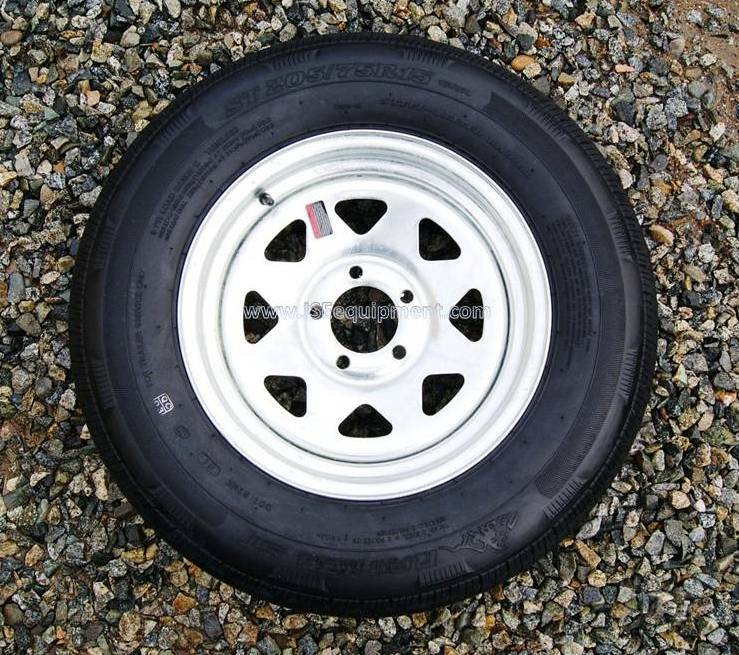 *2 IN STOCK* ST205/75R15D Rainier Radial Tire, Load Range D, 2150 lb Capacity, 5 Bolt 4.5 offset, Mod style rim, Silver. 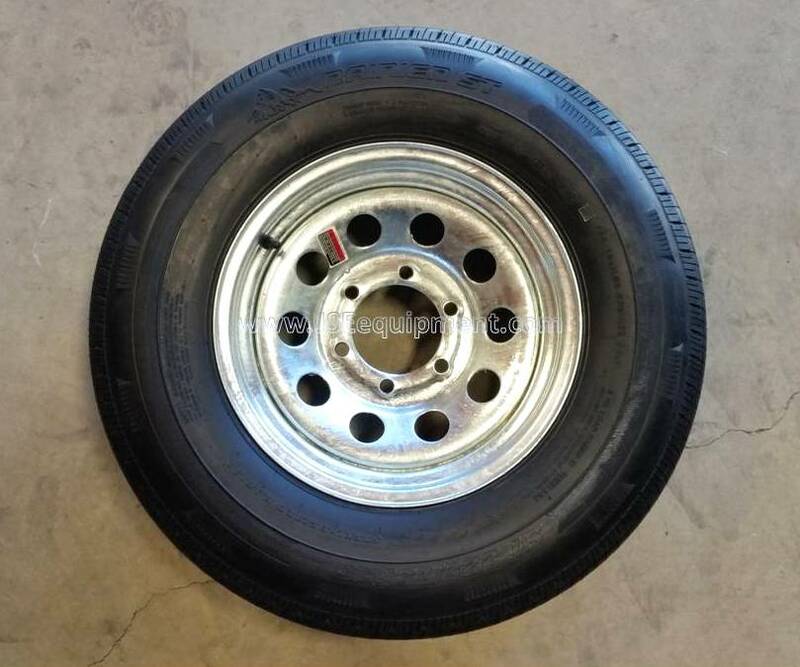 *4 IN STOCK* 15" Trailer Wheel ST205/75R15C Radial Tire, 1820 lb Capacity, 5 Bolt with 4.5 Diameter mount holes, Rainier Brand Tire, Altitude style Aluminum Rim with Black accent. 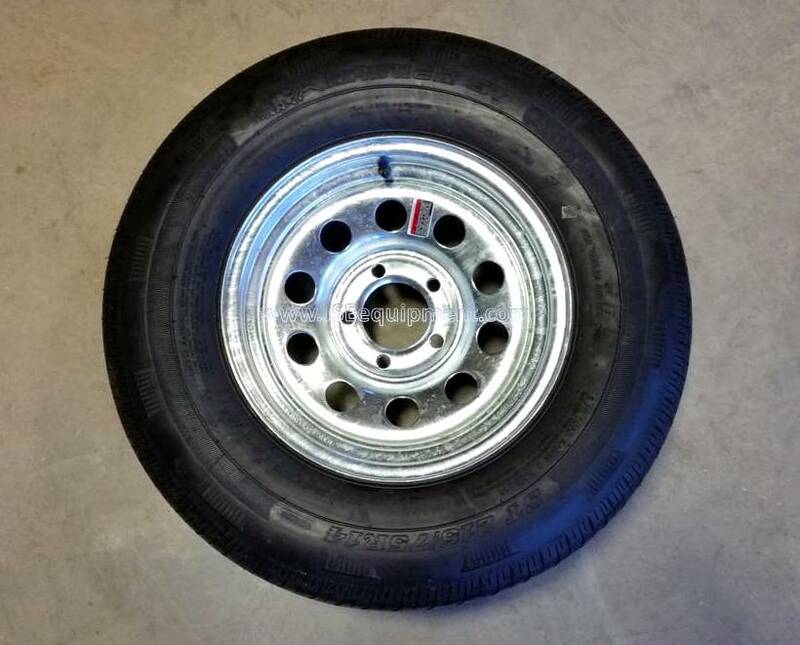 15" Trailer Wheel ST205/75R15C Radial Tire, 1820 lb Capacity, 5 Bolt with 4.5 Diameter mount holes, Rainier Brand Tire, A1411 style Aluminum Rim with Black accent. 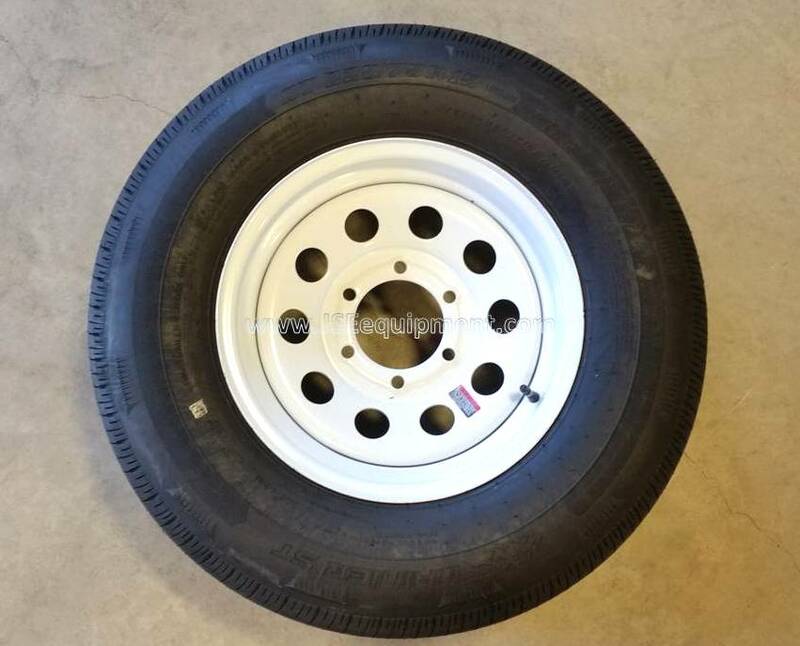 *4 IN STOCK* 15" Wheel ST225/75R15D Radial Tire, Load Range D (8 Ply Rating)2450 lb Capacity, 5 Bolt with 4.5 Diameter mount holes, Rainier Brand Tire, MOD Style Rim, White. 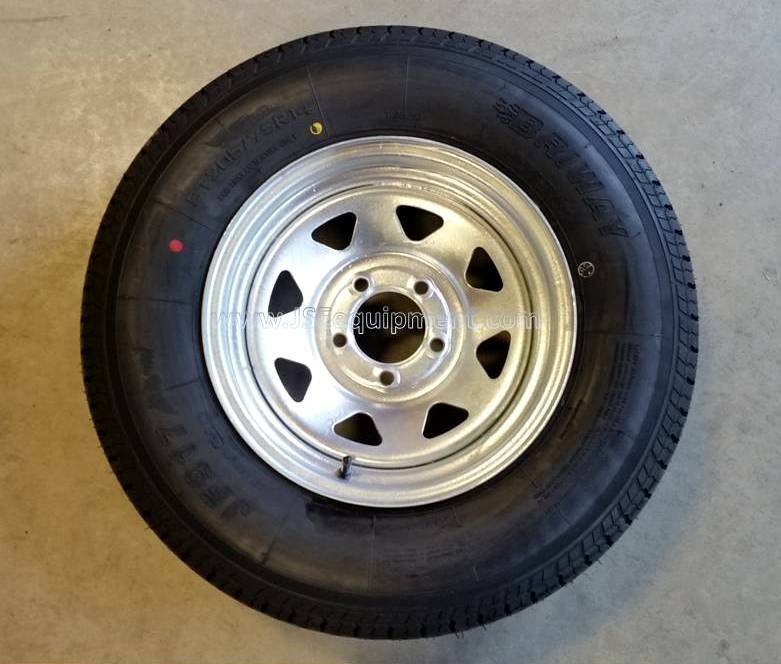 15" Wheel ST225/75R15D Radial Tire, Load Range D (8 Ply Rating)2450 lb Capacity, 6 Bolt with 5.5 Diameter mount holes, Rainier Brand Tire, MOD Style Rim, Galvanized. 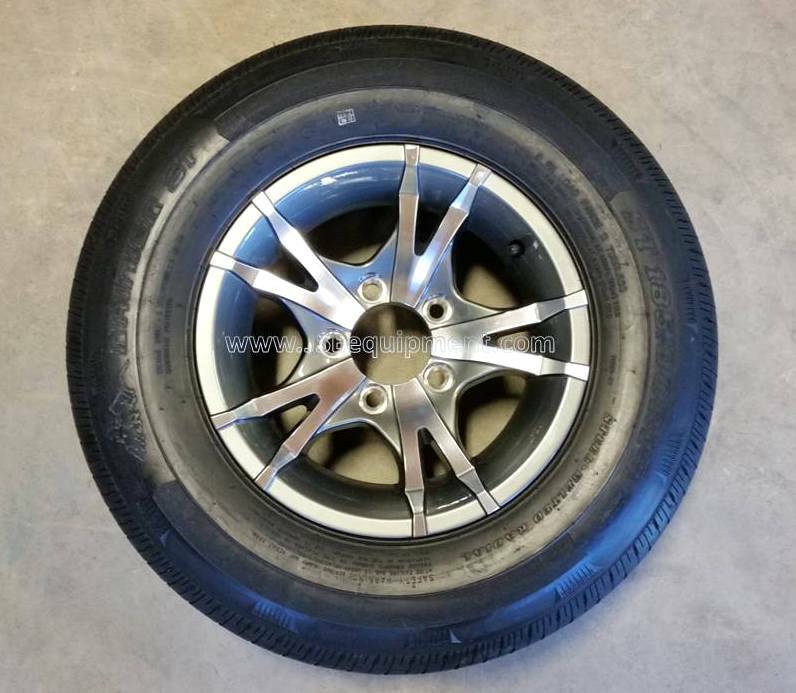 *Special Order* 15" Wheel ST225/75R15E Radial Tire, Load Range E (10 Ply Rating)2850 lb Capacity, 5 Bolt with 4.5 Diameter mount holes, Rainier Brand Tire, MOD Rim, Silver. 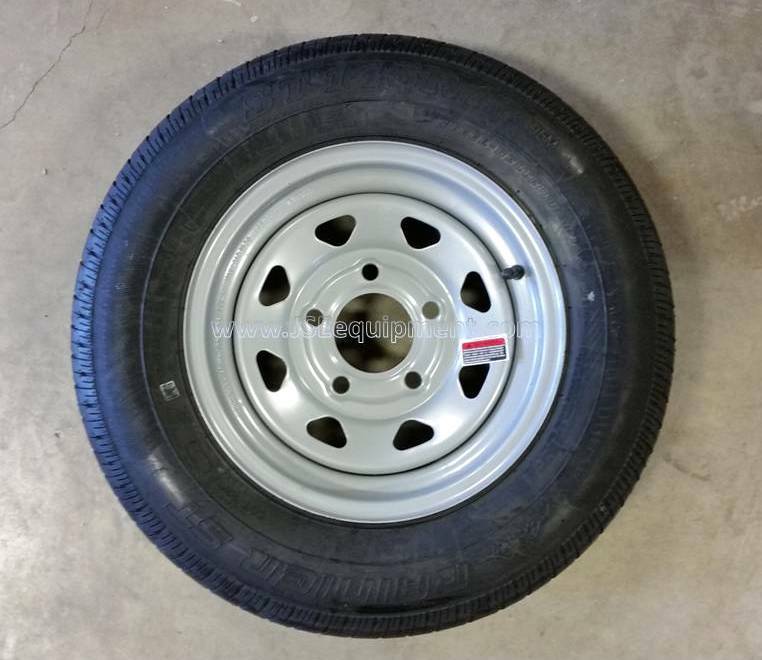 *4 IN STOCK* 15" Wheel ST225/75R15E Radial Tire, Load Range E (10 Ply Rating)2850 lb Capacity, 6 Bolt with 5.5 Diameter mount holes, Rainier Brand Tire, MOD Rim, White. 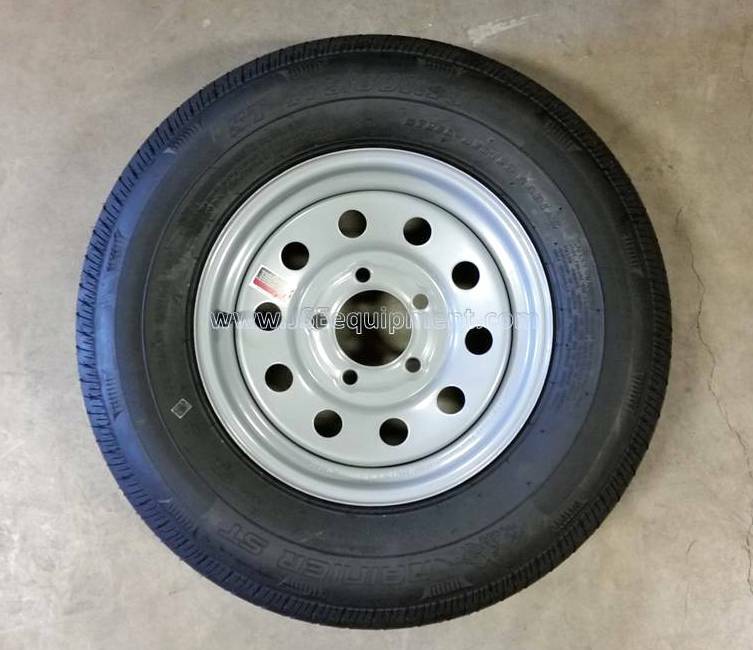 *2 IN STOCK* 15" Wheel ST225/75R15D Radial Tire, Load Range D (8 Ply Rating)2450 lb Capacity, 6 Bolt with 5.5 Diameter mount holes, Rainier Brand Tire, T06 style Aluminum Rim with Silver accent. 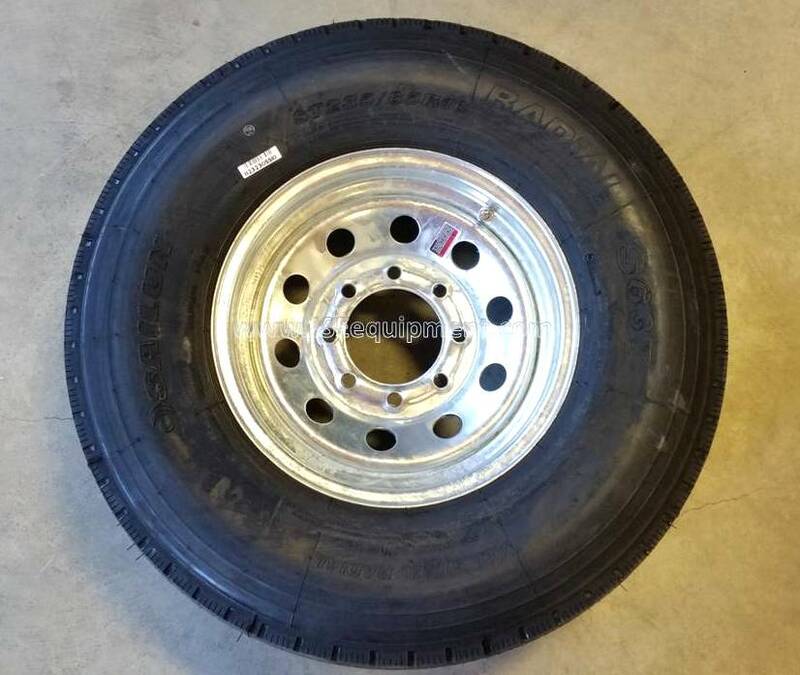 *Special Order* 16" Wheel ST235/85R16G Radial Tire, Load Range G (14 Ply Rating)3750 lb Capacity, 8 Bolt Pattern, Sailun Brand Tire, MOD Rim, Galvanized. 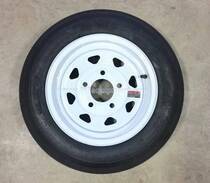 Other Rim colours may be available. 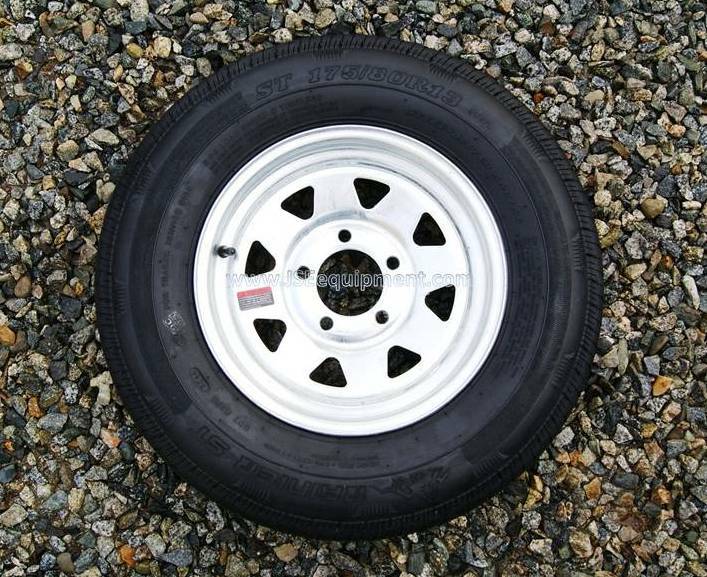 *Special Order* ST235/80R16E Load Range E 3520 LB Capacity @ 80PSI, RAINIER Brand, Tire Only. 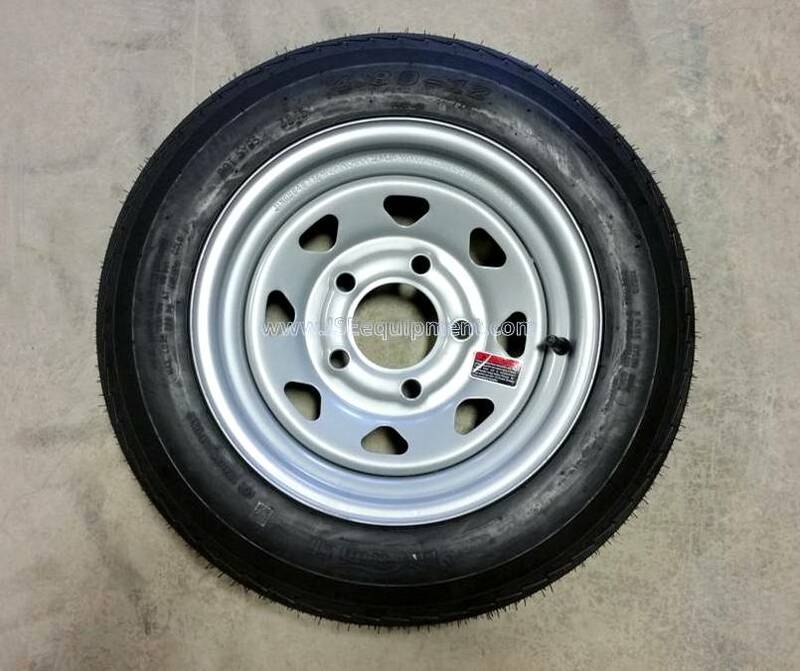 ​Mount and Balance NOT included and not currently offered as a service. 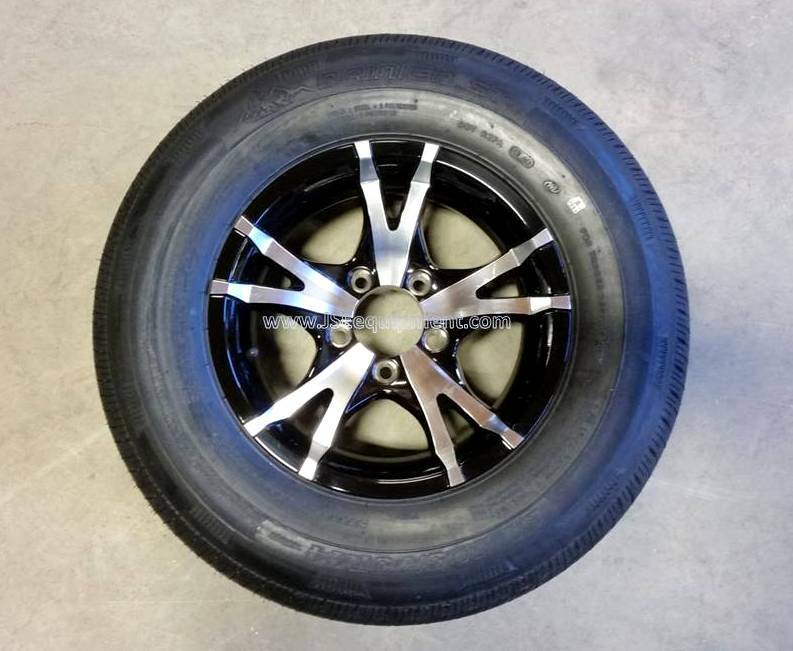 Selling as set of 4 only. 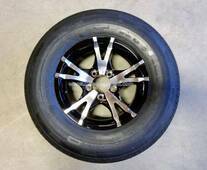 **Rim does NOT include Lug Nuts, Center Cap or Valve Stem / Cap. 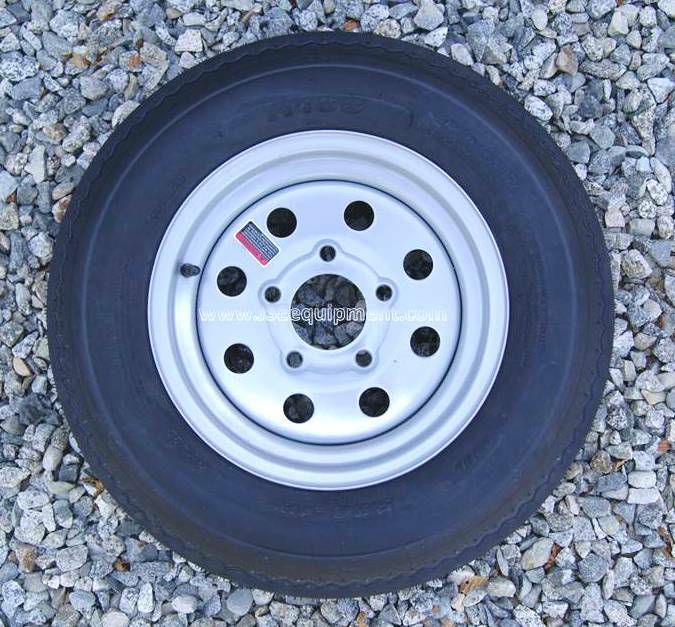 *2 IN STOCK* 12" Rim X 4" Mounting Width, 5 Bolt x 4.5" Diameter holes, 1100 lb Rated, Spoke style, Galvanized. 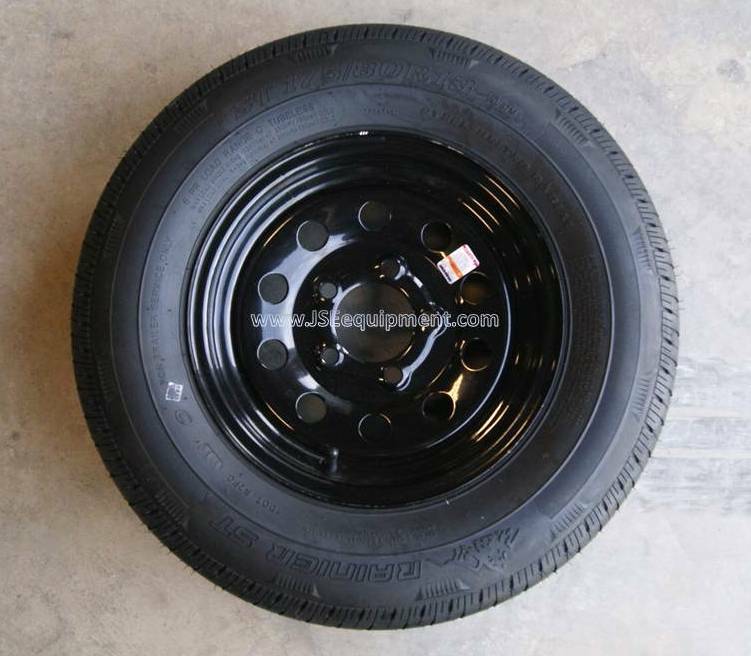 13" Rim X 4.5" Mounting Width, 5 Bolt x 4.5" Diameter holes, 1660 lb Rated, MOD Rim, Black. 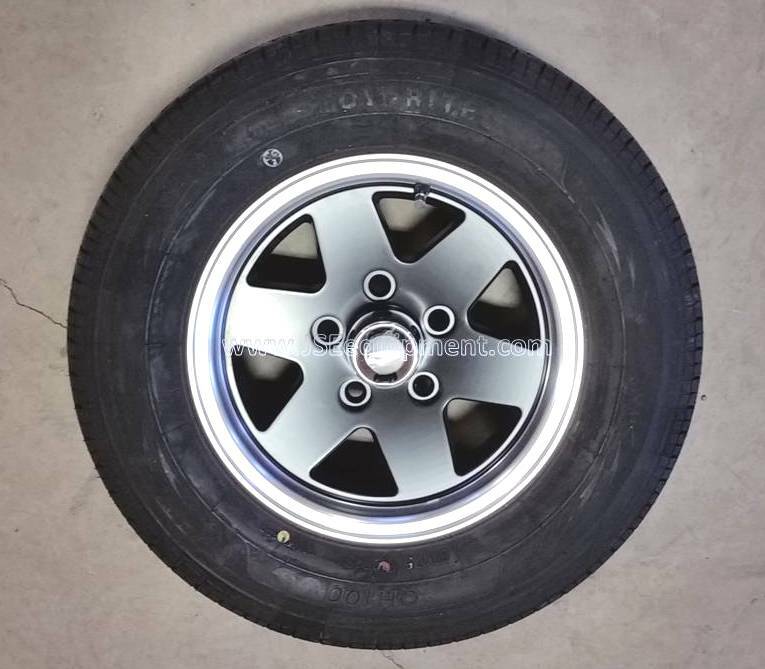 13" Rim X 4.5" Mounting Width 5 Bolt x 4.5" Diameter holes, 1660 lb Rated, MOD Rim, Black. 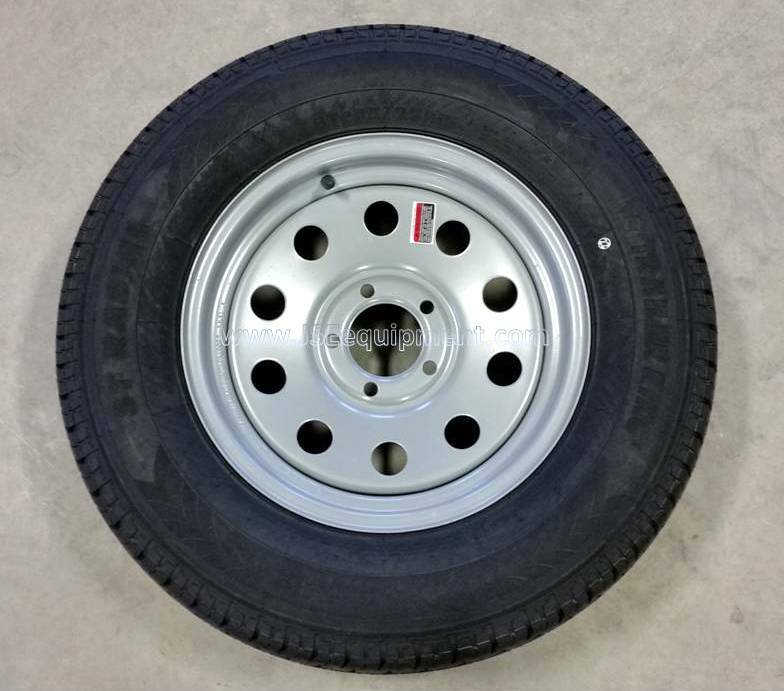 13" Rim X 4.5" Mounting Width 5 Bolt x 4.5" Diameter holes, 1660 lb Rated, Spoke style, Galvanized. 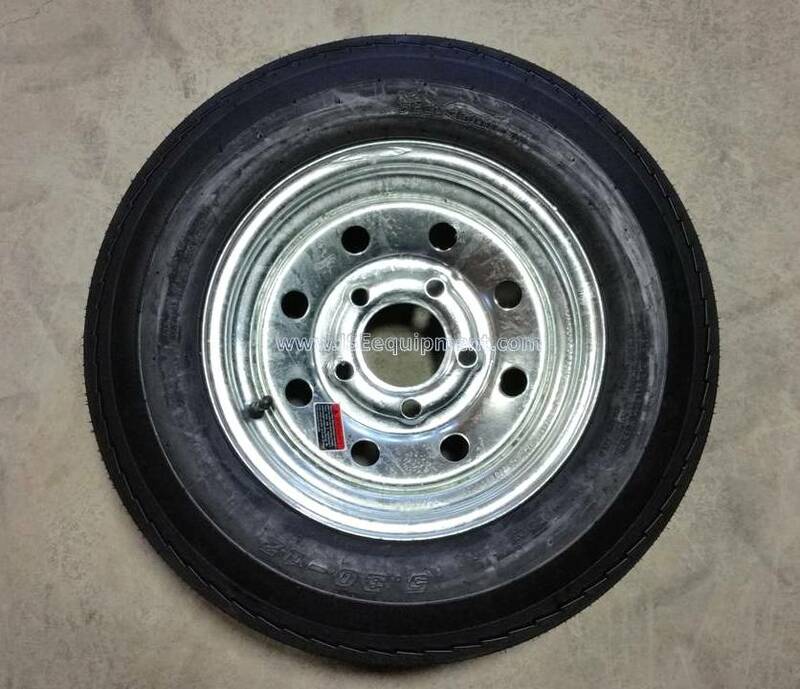 * 1 IN STOCK* 15" Rim X 4.5" Mounting Width 5 Bolt x 4.5" Diameter holes, 2600 lb Rated, Spoke style, Galvanized. 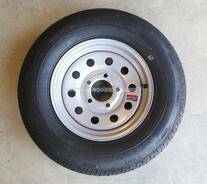 JSE Equipment Does NOT offer any tire repair service, RE and RE Tire Rim machine service or Wheel Balancing. 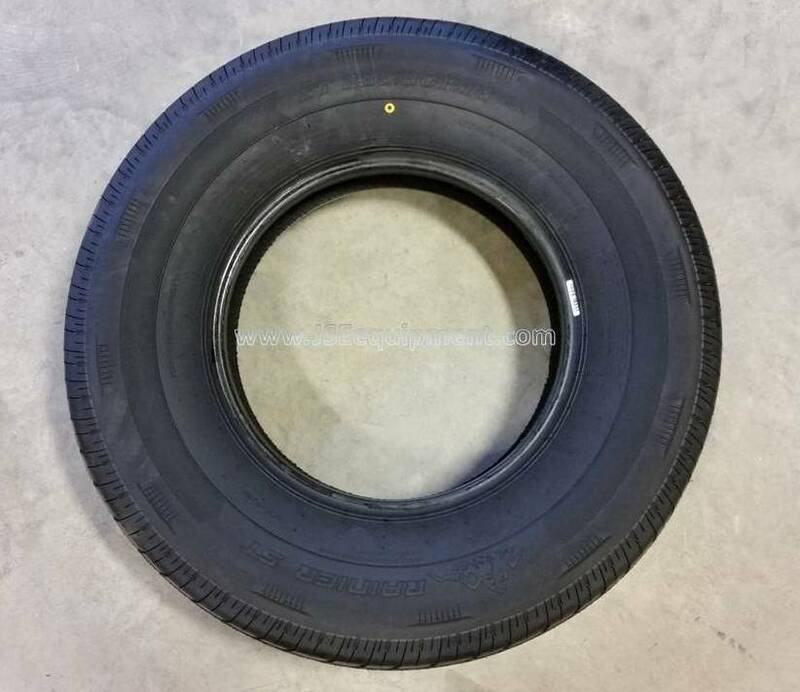 Please contact your nearest tire shop.